What was the 77th New England? Abraham Lincoln famously said to Harriet Beecher Stowe upon meeting her during the Civil War, "So you're the little woman who started this great war." To be honest, he may have not actually said this. And to be even more honest, the war would almost certainly have occurred even if Uncle Tom's Cabin had not been published. But Stowe certainly played a role in giving voice to thoughts and giving courage to people who were thinking them. This year marks an anniversary for Stowe and her most famous book, and it's possible to see early traces of Uncle Tom's Cabin in the first work published under her own name. This month 180 years ago she was celebrating the news that she had won a $50 dollar prize and publication in Western Monthly Magazine for a story she had called "Uncle Lot." The magazine called it "A New England Sketch." The story was about a prototypical New England farmer and was noted for its use of colloquial language--unusual for the time--and for putting dialect into the mouth of Uncle Lot. Both techniques were used nearly 20 years later for Uncle Tom. Slavery did not figure in the story although Stowe (then still Harriet Beecher) had taken the trip to Kentucky that showed her some of the sights and sounds of slavery the previous year. 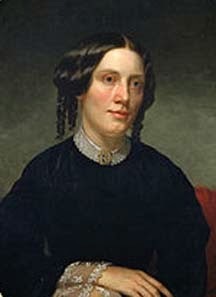 Stowe wrote the story of Uncle Lot while living in Cincinnati with her father, but her most famous works were put to paper in New England, where several of the places connected to her life remain. Most of Uncle Tom's Cabin was written in Brunswick, Maine, where her husband Calvin Stowe was teaching at Bowdoin College. Their house still stands in Brunswick and is still a part of the college. Litchfield, Connecticut, where she was born, retains several sites related to her and her famous family, although not her actual birthplace. The house was torn down several years ago (the pieces are supposedly in storage awaiting someone willing to pay for reassembly) but the site of the home is marked with a sign. You can see the church where the Puritan divine Lyman Beecher, Harriet's father, preached. There are several other monuments to the Beecher family in town as well. In Guilford, Connecticut, there are several contemporary houses still standing in the Nut Plain section, where Harriet spent many months with her mother's family. It was at the grandfather's home in Guilford that she heard stories from an aunt who had married a planter from the Caribbean. The aunt was appalled at the reality of slavery and some of her stories found their way into Harriet Beecher Stowe's most famous work. More information about these sites as well as directions to them are available in my book Connecticut's Civil war. More information is on the book's website www.ctcivilwar.com. The 77th New England didn’t exist, of course, since Union army volunteer regiments were identified by the states rather than the regions that produced them. The “77th New England” was a nickname for the 7th Connecticut and the 7th New Hampshire, two regiments usually brigaded together during the campaigns of 1862-1865 in the southeast,. Today, February 20, 2014, is the 150th anniversary of the Battle of Olustee in northern Florida, perhaps the least successful day in the history of the 77th New England. Earlier in February of 1864 Brigadier General Truman Seymour had arrived in Jacksonville, tasked with destroying Confederate supply routes and securing modest union influences in northern Florida. Otherwise, that part of the Confederacy was insignificant. Seymour led his small 5,000-plus man expedition (including the 77th New England) westward along existing rail lines, expecting to meet nothing more than Florida militia, composed primarily of young boys and older men. Instead, on the afternoon of February 20, the force met up with 5,000 entrenched Confederate soldiers near the town of Olustee, just east of Lake City. After hours of battle, the Union expedition was forced to retreat towards Jacksonvile, leaving the Confederates in control of the field. The 77th New England performed poory, particularly the 7th New Hampshire. The 7th Connecticut was never fully engaged. Both regiments were part of the brigade under the command of then-Colonel Joseph R. Hawley of Connecticut, who was enjoying (or not) his first command independent of General Alfred Howe Terry, also of Connecticut. One regiment did perform admirably. The 54th Massachusetts, the regiment of black soldiers so honored in the 151 years since its glory in defeat at Battery Wagner near Charleston, played the key role in saving a broken down train carrying wounded Union soldiers back to Jacksonville. Otherwise, the day was a disaster for the Union. With 1,800 men killed, wounded, or missing, the expedition suffered a 34 percent casualty rate—among the worst of any battle of the war. News of the victory elated the South, for whom successful days were becoming fewer and fewer. The 77th New England left Florida for Virginia where the two regiments became part of the seige of Petersburg. Then,in January of 1865,they were sent to join Terry's Provisional Corps. They participated in the relentless move of Sherman’s Union army across the Carolinas to the real end of the war, which happened in North Carolina rather than at Appomattox.